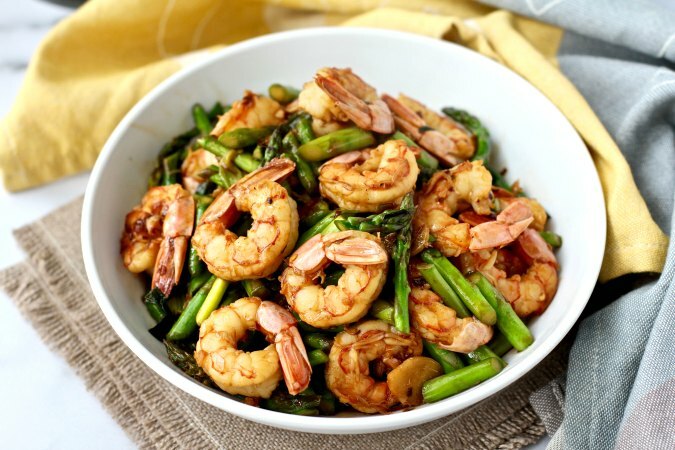 This shrimp and asparagus stir-fry, with a pound of fresh asparagus and seasoned shrimp, is a tasty and quick way to get a nutritious dinner on the table. 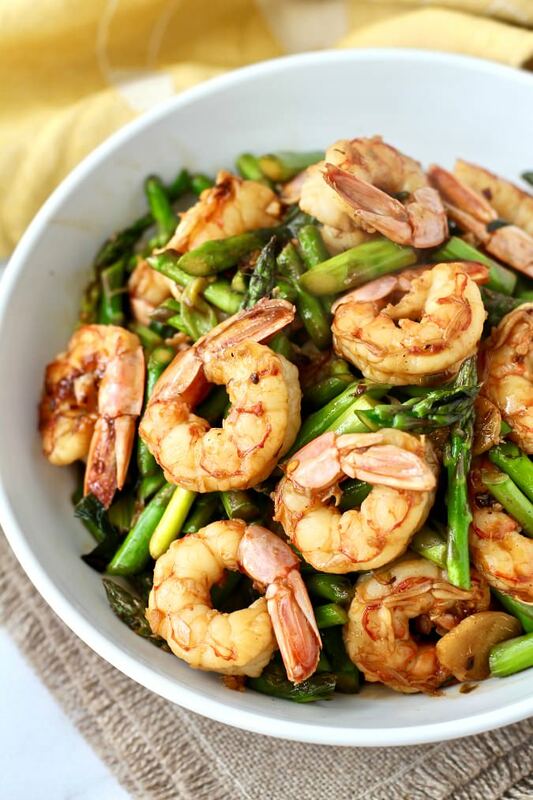 This shrimp and asparagus stir-fry takes just a few minutes to make and the results are so flavorful. I love stir-frying. Some of my favorite stir fries include Kung Pao Shrimp with Cashews, Asparagus, Pea, and Leek Stir-Fry, Yang Chow Fried Rice, and Shrimp Fried Rice with Vegetables. You can also check out my Index and scroll down to the Wok Wednesdays section to read more about my wok adventures. Typically, there are a lot of seasonings in a stir-fry, usually in small amounts. You usually need to have little bowls of mixed sauces, herbs, and/or spices that you toss into the wok at precise times. Mise en place is critical as there is no time to dawdle once you get started. This stir-fry has a pretty reasonable ingredient list, with the most exotic item being Shaoxing rice wine. If you can't find it, dry sherry will work perfectly as a substitute. Season the shrimp and set it aside in a bowl. In a small bowl, mix the soy sauce, rice vinegar, and Shaoxing rice wine. Mix the scallions and ginger in another bowl. Have the cut asparagus ready to go on a plate or bowl. Add a tablespoon of oil in two small prep bowls, or if you have tablespoons that can stand up straight on your counter, you can live dangerously and fill two separate tablespoons. Have some salt available for grabbing a pinch as you cook. You'll also need a clean plate for resting the partially cooked asparagus while cooking the shrimp. Set aside any topping or garnish you will be using. Line up the ingredients in the order that you are going to use them. I also like to have a digital kitchen timer to time each step. This stir-fry is delicious with with steamed white rice. You can garnish it with sesame seeds, chopped peanuts, and even sliced jalapeños. I am so happy to see fresh asparagus available, signaling that spring is just around the corner. I combined it with wild caught Argentinian shrimp. These shrimp are so sweet, almost like lobster. I bought the shrimp with the shells on just so I could save and freeze the shells to make shrimp stock. Totally worth it. This month the Fantastical Food Fight theme is Asparagus! Which of these asparagus dishes will win the crown? This recipe was adapted from Bon Appetit Magazine. 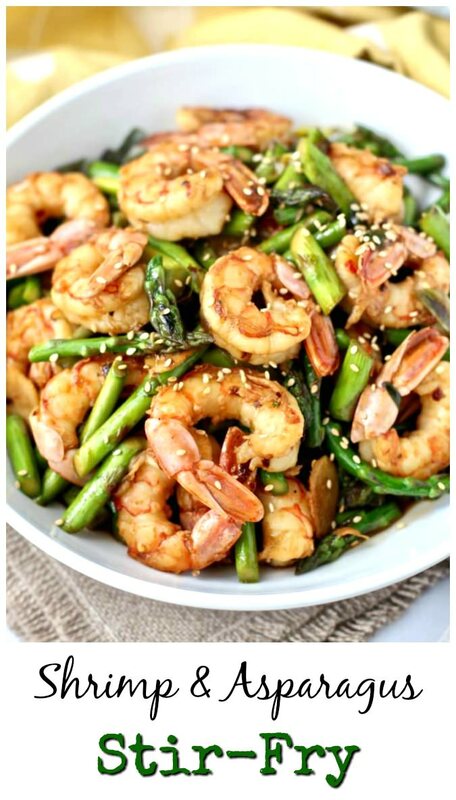 In a medium bowl, mix the shrimp, cornstarch, pepper flakes, a pinch of salt, and a tablespoon of soy sauce. Set aside. In a small bowl, stir together the rice vinegar, rice wine, and 2 tablespoons of soy sauce. Set aside. Heat a wok over medium high heat. It should be ready when a tiny drop of water dances across the surface and evaporates immediately. Swirl in one tablespoon of the oil. Add the scallion and ginger and cook, stirring constantly, for about two minutes. Add the asparagus and a pinch of salt and stir-fry for about four minutes, until the asparagus is bright green. Transfer the asparagus to a plate and set aside. Add another tablespoon of the oil to the wok over medium high heat. Add the shrimp and spread it out over the surface of the wok in a single layer. Cook without touching it for one minute. Flip the shrimp over and cook on the other side for another minute or two, until the shrimp is just cooked through. Add the soy/vinegar/wine mixture and add the asparagus back to the pan. Cook, stir-frying the ingredients until the sauce just thickens, about 30 to 60 seconds. Move the ingredients to a serving bowl. Sprinkle with toppings of your choice. How to stay in touch with Karen's Kitchen Stories? While you’re here please take a minute to follow me on Pinterest and on Instagram. woman you are blogging up a storm again.... I stopped by to re-read the oreo blog post, and wow, two more were here and I never even knew about them! I think you'd both like this one. I know, two posts in one day, but I do get involved in these groups and it gets crazy! I could go for a bowl of this right now! It looks delicious. That looks so unbelievably fabulous!! This looks so good and the recipe seems great- I just need to get rice vinegar! Thanks! The vinegar is worth it! This is a tempting bowl.